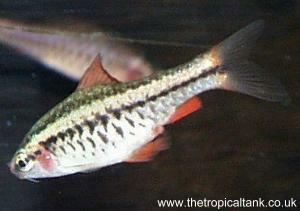 Left: Adult, Right: Young Cherry Barb, yet to develop adult colouration. Tank setup: Planted tank with plenty of cover and some open swimming space. Compatibility: A peaceful barb for the community tank. Feeding: Omnivorous: most foods accepted, include a vegetable component. 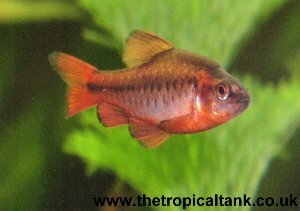 Sexing: When in breeding condition, males become a deep cherry red, females are brownish-red. Breeding: Spawn on fine leaved plants. Eggs hatch in 24 hours. As with other barbs, the parents are likely to eat the eggs if they have the opportunity. Comments: This species is not as inclined to shoal as other barbs, and individuals will tend to stick to their own space in the aquarium. They are especially suitable for keeping as a single pair.